Plans for a £25 million Central Lincoln Transport Hub have reached the next stage as work is now underway to develop a planning application by April. As previously reported, the plans include a new bus and train station, a 1,000 space car park and new pedestrian footbridges, which are hoped to regenerate the city. 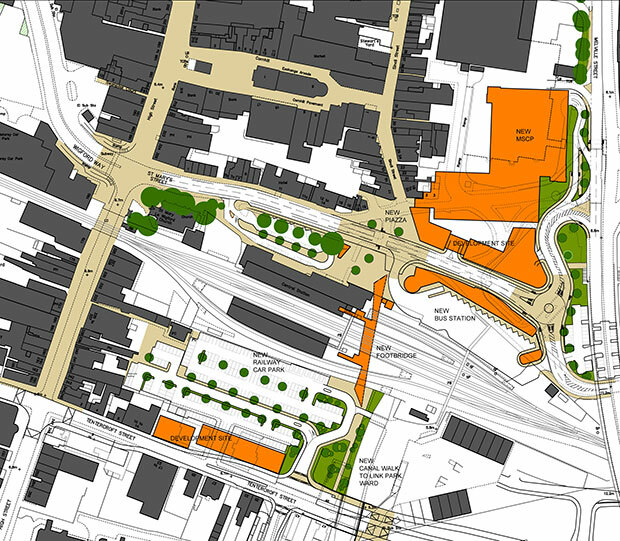 The site plan for the new Lincoln Transport Hub. The scheme would be led by the City of Lincoln Council in partnership with Lincolnshire Co-op and Network Rail, working with East Midlands Trains and Lincolnshire County Council. Subject to planning consent and getting extra funding, work is planned to start on the site in September 2016 and be constructed within two and a half years. The project was awarded £11 million of indicative Single Local Growth Fund (SLGF) grant in summer 2014, approval of which is expected by September 2015. The commitment of an additional £787,470 from the council’s capital funds however stands as a “risk”, dependent on the security of extra funding. City of Lincoln Council Leader Ric Metcalfe said: “There is a huge amount of work now going on to prepare a planning application later this year. “There are still negotiations going on with all of the stakeholders in the project to maximise contributions that we hope all of them will make. “We are continuing to refine and shape up the plans for that planning application — that will be a big watershed getting that in place. “This is going to be an absolutely fantastic project for Lincoln and it really will really help the city get off the ground in a huge way. “The council is sticking its neck out with this project; £1.3million expenditure is a big risk for the council. “But this is so important for the city that we believe it’s a risk worth taking. We’re going to work extremely hard to make sure that risk is properly managed and minimised. There will be a four-week public consultation beginning on January 23.